Health authorities recommend that a typical person drinks at least two liters of water each day. However, most adults and youth in the U.S. fall short of that recommendation, according to the Centers for Disease Control and Prevention. A team of Northwestern Engineering students tackled this problem during a ten-week course titled Human-Centered Product Design. When a user goes to refill a water bottle at a drinking fountain or sink, they may encounter difficulty with easily filling their bottle due to issues with water pressure, shallow basins and water bottle sizes. To solve this problem, the team designed the Fountain Flex, a light low-profile sleeve and funnel that allows users to easily fill water bottles at any sink or fountain. The sleeve slides onto the outside of the bottle and has a pocket where the funnel is stored. Thanks to the pocket in the sleeve, the Fountain Flex affords easy storage, portability, and accessibility. When a user comes across a fountain where they cannot fully fill their water bottle, the funnel can be removed from the pocket, attached to the bottle to allow for easy filling, and then quickly stored again in the sleeve. The final prototype for the Fountain Flex consists of a funnel made of Mold Star 20 silicone mold rubber from Smooth-On Inc and a sleeve made of knitted form neoprene. The funnel consists of a lip (that allows it to attach to the rim of the bottle) and a curved surface (to direct the flow of water). The lip is designed to be an interference fit in order maintain a secure connection with the rim of the bottle. The surface of the funnel is designed to easily direct the flow of water into the water bottle with minimal spilling or leaking. The top of the funnel has an upwards curve so that water cannot leak over when the bottle is being held horizontally. The curvature of the device matches the curvature of the water bottle, which directs water to the middle of the surface and prevents it from leaking over. The team began by distributing a survey to the Northwestern community that asked respondents to rate the ease of using various types of water filling stations. 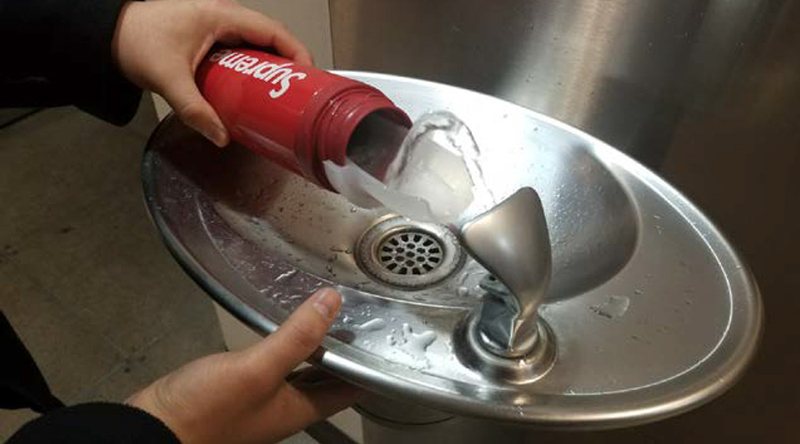 Based on the survey responses, the team decided to focus on filling water bottles at water fountains and sinks. In an effort to better understand the pain points of using each of these water filling stations, the team conducted user observations and user interviews around Northwestern’s Evanston campus. Next, the team completed a round of internal testing at water fountains and sinks on campus using a variety of water bottles with different lengths, widths, and opening diameters. The team recorded fill percentage, fill time, and ease of use at twenty-nine sinks and water fountains. The data revealed that 7 out the 29 of the locations filled the bottle less than 75%, the average ease of use was a 3.25 out of 5, and the average fill percentage was 89%. This data helped the team decide to develop a solution to improve the ease of use. Next, the team moved onto building and testing design concepts. While building and testing design concepts, the team realized that a large curved surface was necessary to effectively guide the water into the opening of the water bottle. This realization led the team to develop two concepts: "The Foldable Insert" and "The Extended Arm Funnel." Although "The Extended Arm Funnel" was an improvement on earlier concepts, the team eliminated it due to its bulkiness and difficulty of use. The team decided to move forward with the “The Foldable Insert” because it had the easiest set up of any of the concepts and the greatest potential to function successfully with a range of water bottles. Once a final design for the funnel had been chosen by the team, the team developed the concept of the sleeve. Their primary goal as they developed the sleeve concept was to find a method to allow the funnel to be attached to the water bottle while simultaneously ensuring the funnel remained sanitary when not in use. When manufacturing the final prototype, the team decided that it was critical to create a universal design that could fit all water bottles. The team briefly considered 3D printing the funnel, but they ultimately opted to use pour-over silicone in a printed mold. Mold Star 20T was selected because it had a stiffness that would allow it to fit snugly on a variety of water bottles, but still bend back into shape. The final prototype of the Fountain Flex affords easy filling of a water bottle at almost any sink or drinking fountain, even if there is low water pressure or a shallow base. Because the lip of the funnel securely attaches to all water bottles and does not come loose over the course of the water bottle being filled, the Fountain Flex can be used with one hand. Finally, the Fountain Flex is made from a dishwasher-safe material, so it can be easily cleaned.